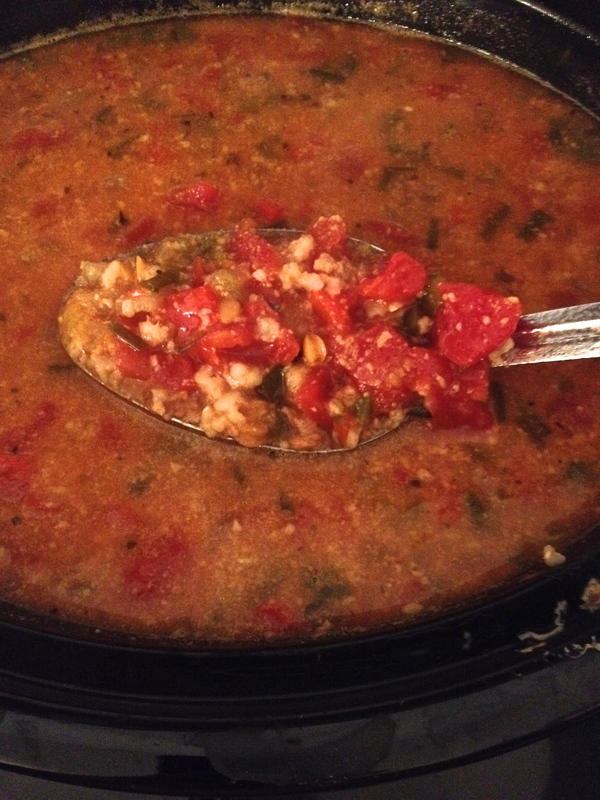 African (inspired) SPICY Lentil Soup …. with Peanut Butter, Brown Rice, and Lentils ! 1 tsp. Cayenne Pepper.. recipe calls for Aleppo Pepper.. I could NOT find it. I used my favorite 5 Qt Crockpot for this.. but I think you could use 3.5 Qt for it too. Chop onions, green onion, bell peppers, and garlic and place in crockpot. Add canned tomatoes with juice, Vegetable Stock, ground cumin, chile powder, cayenne pepper, lentils, and brown rice. At 4 hours (on high ) add in and stir Peanut Butter it will dissolve .. or at 8 hours (on low).. then turn to low and let cook for one more hour. Serve as is or with croutons … DELISH ! As I began to Love myself…. Please share… create a great day !